I love Fettucini Alfredo – but I feel my heart slowly exploding every time I eat it. It’s so good, but so bad for you (like many things that are so good). So I went on a little internet search and found some inspiration for my own Alfred0- with a lot less love handles involved. I didn’t take any photos while cooking- sorry! I was in the zone I guess. But this is really easy to make- your secret ingredient is the greek yogurt. This takes the place of your heavy cream in the alfredo sauce. Chop up your chicken and cook it. Chef’s choice- grill it, bake it, whatever your heart desires. We pan fried it on the stove top. Cook your broccoli in the microwave- just follow the instructions on your package. Cook your pasta in a large pot. While your pasta is boiling- it’s time to make your sauce. Pour the extra virgin olive oil in a large pan along with a few dashes of minced garlic. Let it simmer on low for a minute. Next, add your flour, and whisk while you add. This will thicken your little mixture up a bit and it will start bubbling. Keep whisking! Slowly add your chicken broth and milk while you keep whisking. 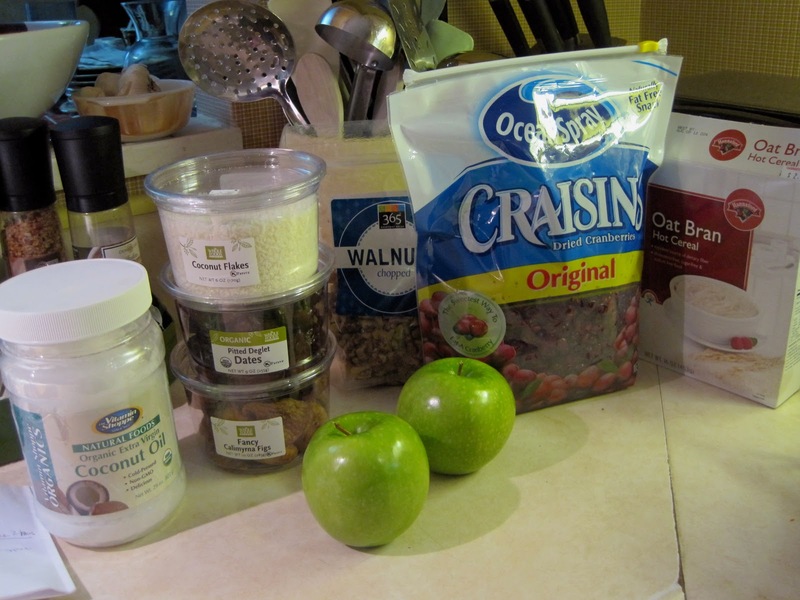 Next you will add in your secret ingredient- greek yogurt! Lastly- whisk in your parmesan cheese. Let your sauce heat up on low while you add your chicken and broccoli to your pot of penne (drain your pasta first incase you forgot about that). Pour your alfredo over the top and you are ready to go. 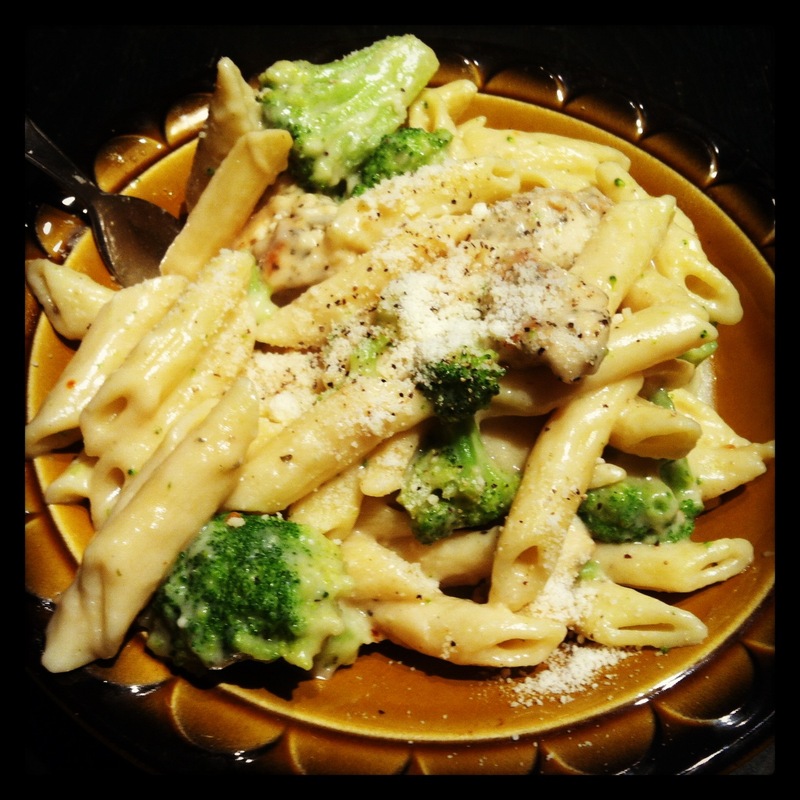 Top each plate off with some extra parmesan cheese and pepper- and you have yourself some skinny alfredo! 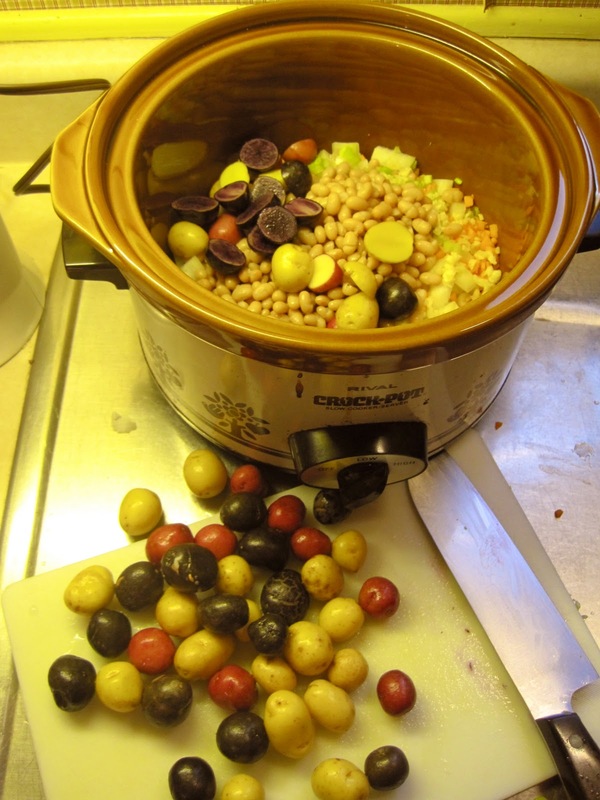 This recipe feeds 4 very hungry people. My sister got me a juicer for Christmas this year because I had been talking about how interested I was in trying a cleanse or a juice fast. I looked up a few recipes and went shopping yesterday for ingredients for 4 different juices I wanted to make. I decided to start with the easiest and least complicated juice recipe, and thought I’d share. Dump all of these items into the juicer. 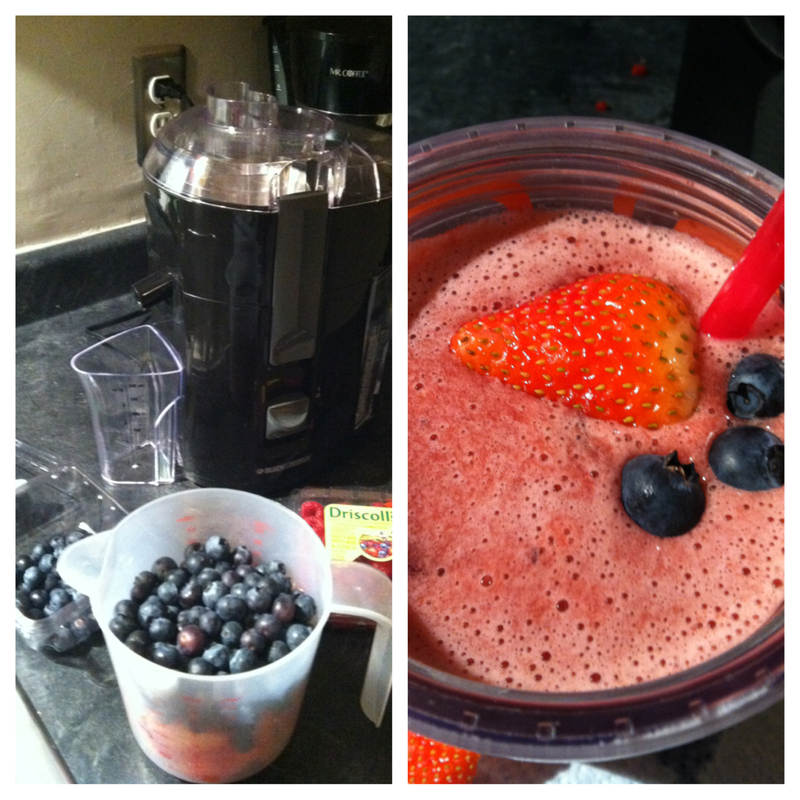 -a ton of ingredients only makes an itty bitty amount of juice. 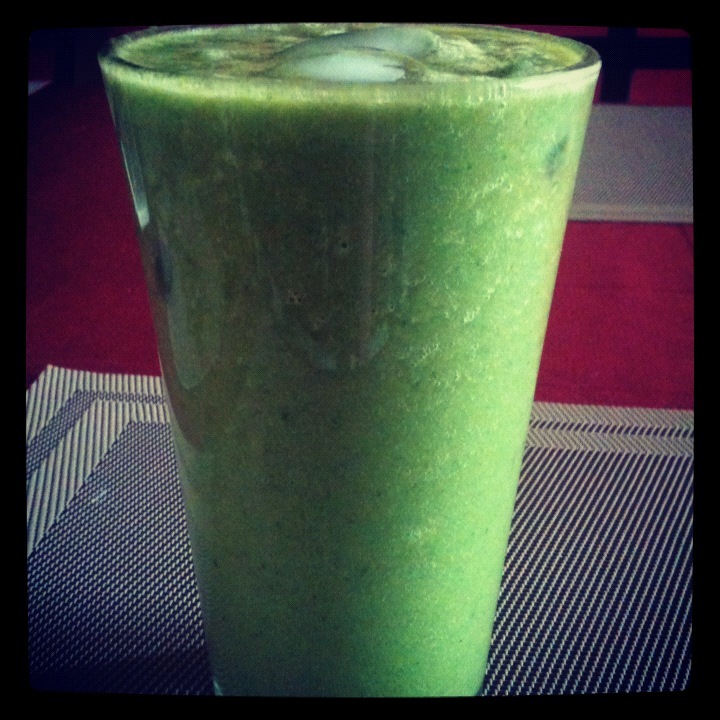 -it’s very addictive and I’ll probably be juicing a few times a week. If anyone is an expert juicer- I would love to learn some new recipes! I found some great ones here as well. Also, any tips or ideas on how to keep the price of juicing low so I don’t go broke, or how to re-use the pulp- I’m all ears. 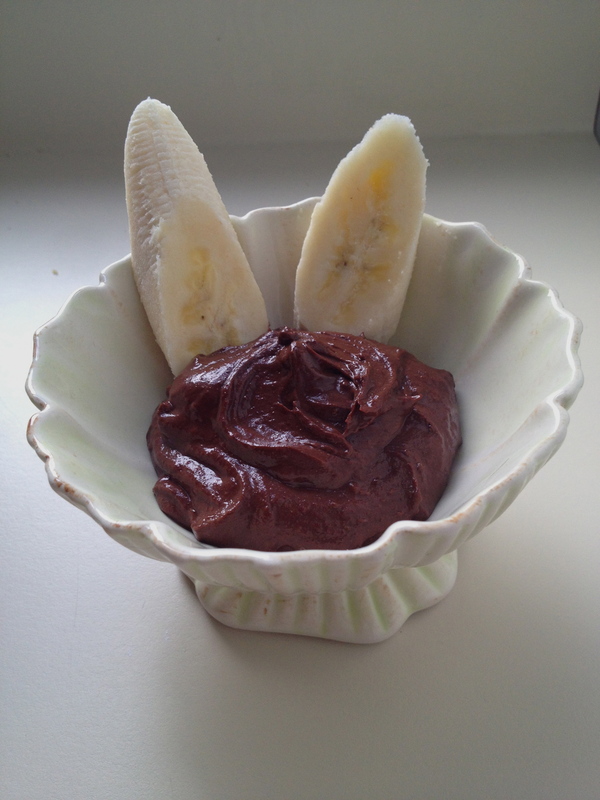 Here’s a little recipe that my friend Katie made and wanted to share with you guys! Throw two handfuls of baby spinach in your blender. Cut up 1 cup pineapple and 2 bananas into chunks and toss them in the blender too. 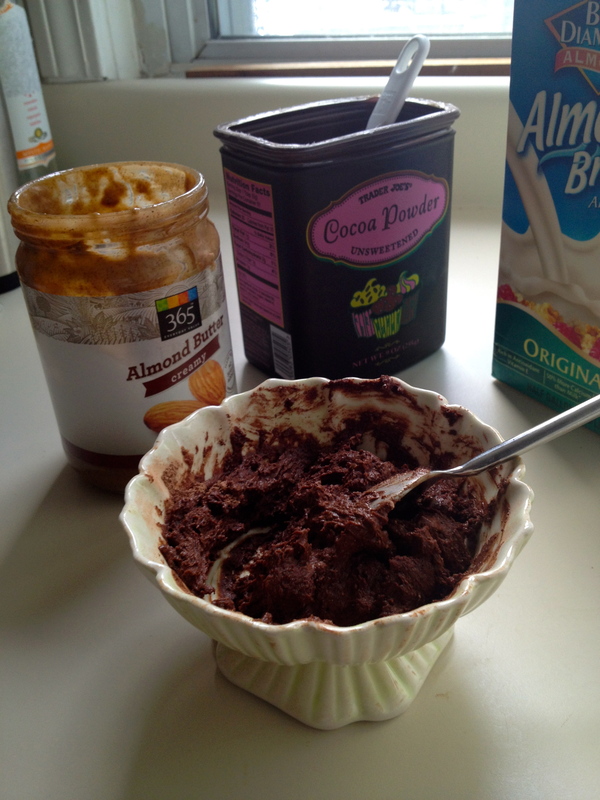 Add 1 cup of yogurt to make it more creamy, or add a scoop of protein mix (or both!). 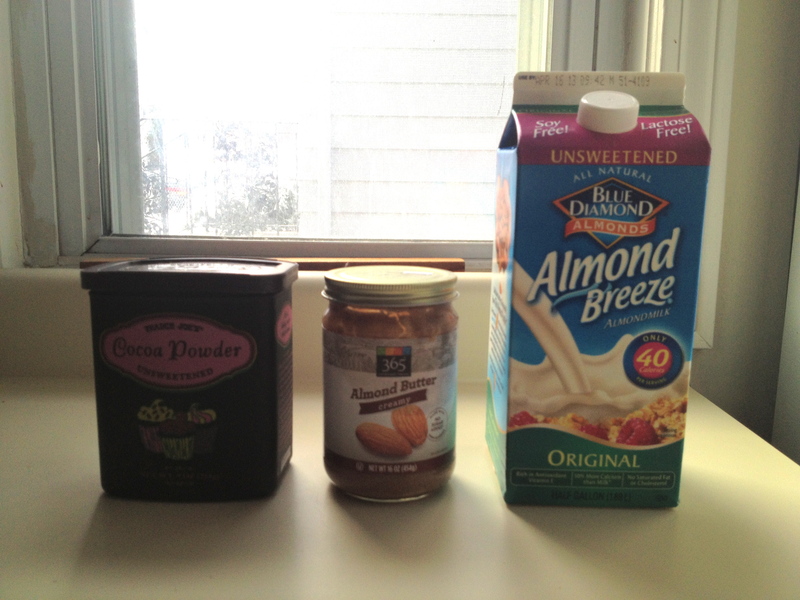 Add 1 cup water, blend, and enjoy! This is perfect to make at the beginning of the week and then put in the fridge and just pour yourself a glass each morning. Rainy days were made for cooking! I work at a pizza place and you’d probably think that on my days off I would stay clear of the kitchen, but that is not the case. My days off usually have me trying out new recipes and taking the kitchen over for myself, and this day off was no different. I knew I was going to make the Larabars, if you haven’t tried them, they are granola-y type bars made with only fruit and nuts, no added sugars or fillers, but the downside is they are ridiculously expensive. I had seen many recipes online on how to make your own versions so I figured my day off would be a great time to try it out. 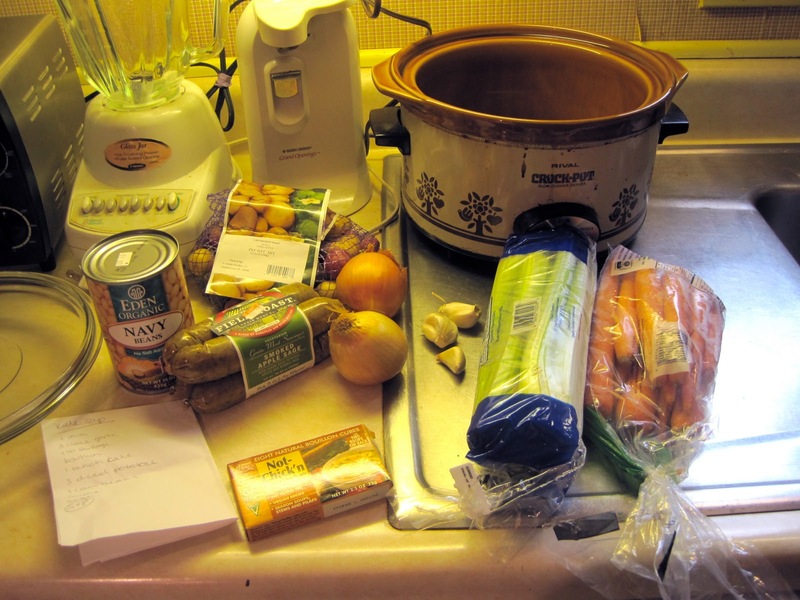 Since I was already on my way to the grocery store, I decided I should come up with something to make for dinner – kale soup! 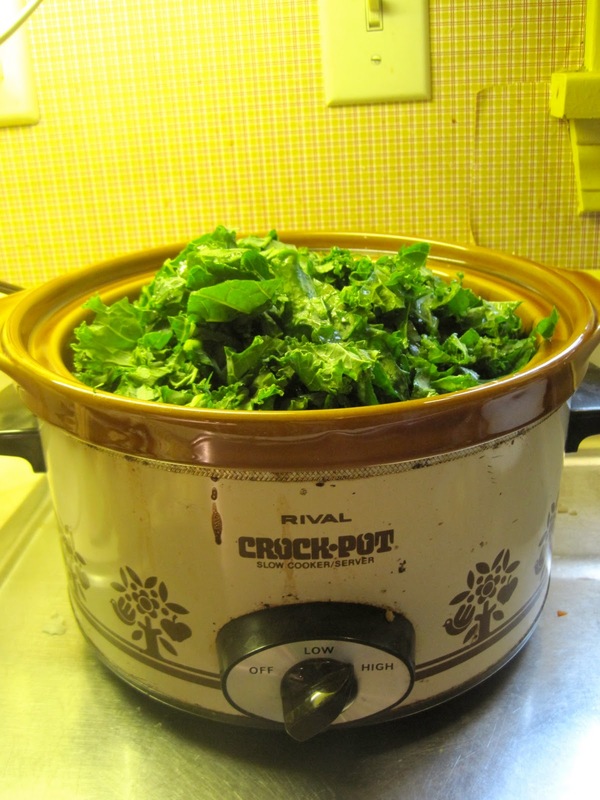 I have been craving kale lately and the crock pot has become my favorite appliance(just ahead of the food processor) so I knew how my day was going to go from there. 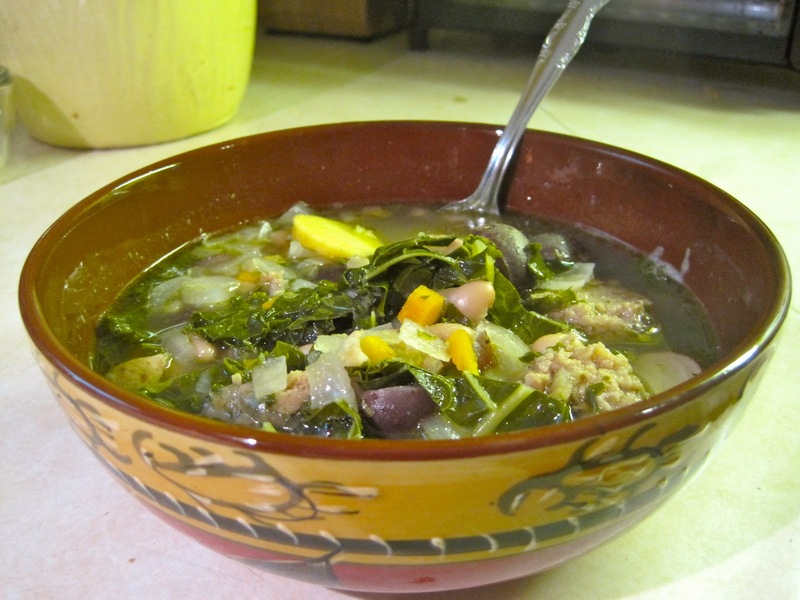 I started with the kale soup knowing it would need to simmer for at least 4 hours. The potatoes were just too cute to resist, though I’m sure any other potato would have worked just as well in this soup. Full to the brim and ready to work its magic! 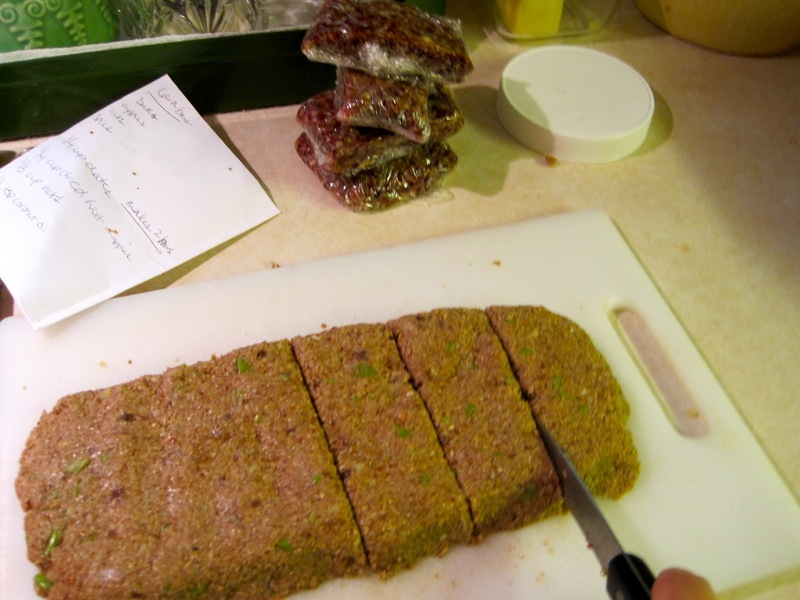 While being taunted by the smell of the soup, I got to work on the Larabars. 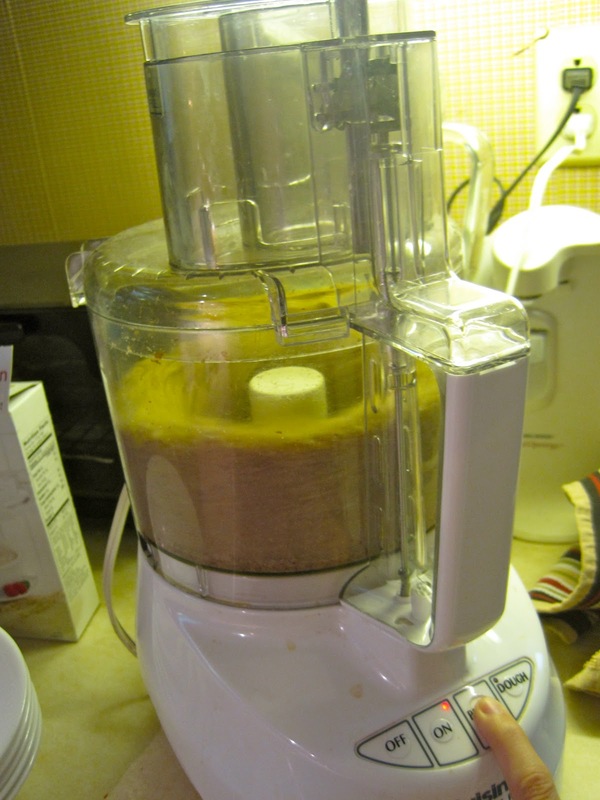 Using that trusty food processor, I chopped everything down to a size that is relatively the same – a little bigger than grains of sand. 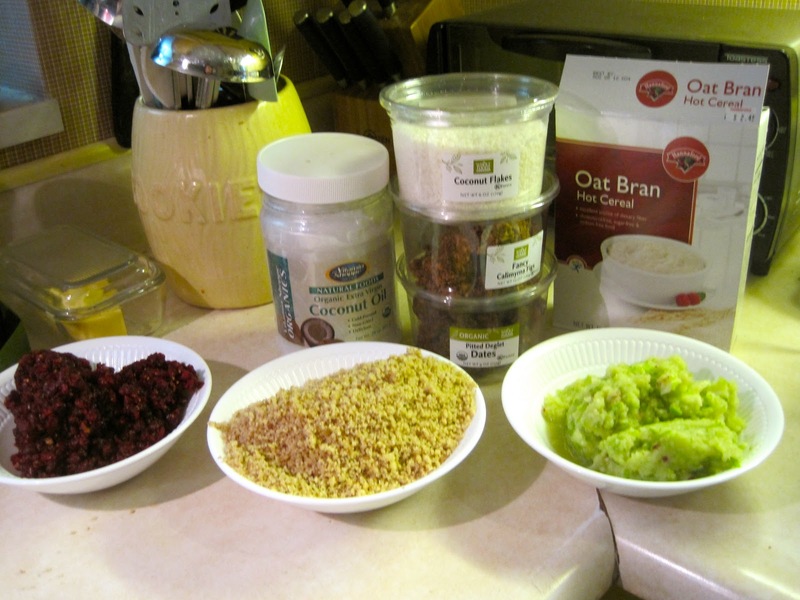 Here are the ingredients ready to be mix and matched for different varieties. 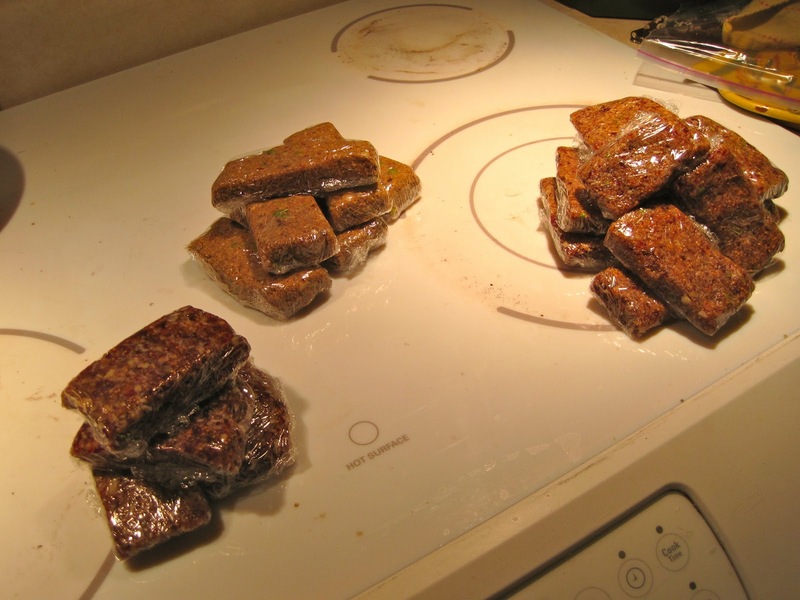 All of the Larabars use dates and figs as their base and sweetener. They also all have nuts in them almost as a binding agent. 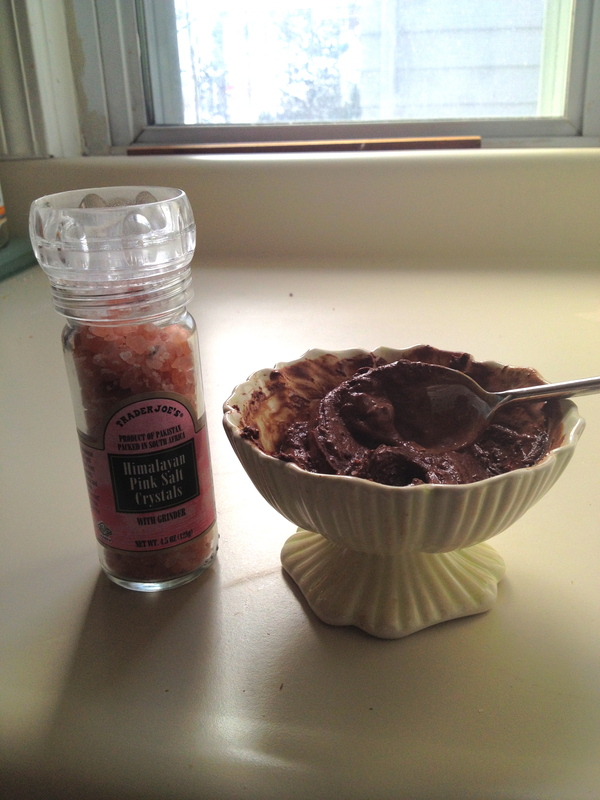 I used the coconut oil to smooth the mixture out a bit, and when necessary I added the oat bran to thicken it up. 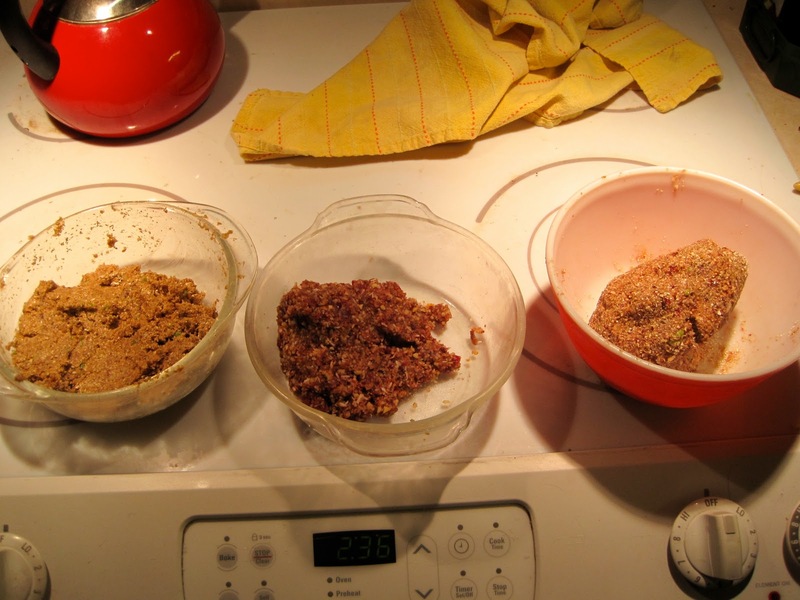 Here are the three variations I made from left; Apple Cinnamon(based off of Larabar’s Apple Pie), Cranberry Coconut and a mixture of the two(just to use up the rest of the ingredients). I then patted the mixtures out on a cutting board and divvied them up. What good timing, once I wrapped up the Larabars, cleaned up the disaster of a kitchen and got the dishes started my soup was ready to eat! It was a bit early for dinner but I hadn’t eaten lunch yet so this was a perfect mid-afternoon meal to fuel me back up for yoga tonight. Bon Apetit!